Bezymianny (Russia). During 5-12 February a thermal anomaly was detected in satellite imagery. A new lava flow from the lava dome was detected on 6 February, and fumarolic activity was observed on 7 and 9 February. The Aviation Colour Code level was lowered to Yellow. Llaima (Chile). Steam-and-gas plumes were observed rising from the main crater during 20 January-9 February. Seismic signals (tremor and volcano-tectonic earthquakes) had characteristics that indicated fluid movement within the volcano’s conduits. The Alert Level was raised to Yellow, Level 3. Soufrière Hills (Montserrat). During 5-12 February activity from the lava dome increased significantly, concentrated on the W side of the lava dome during the first part of the week then the N side from 9 February. Part of the lava dome collapsed on 11 February leaving a large scar on the NE flank. Pyroclastic flows traveled NE and then, with pyroclastic surges, across the sea at several places on the E side of Montserrat. Pyroclastic flow deposits covered several hundred metres of the coastline near the old Bramble airport, about 5 km NE. Pyroclastic flows also traveled NW into Tyers Ghaut and down the Belham valley as far as Cork Hill, 4 km NW. An ash plume rose to 15.2 km a.s.l. and drifted E and then SE. Ashfall occurred in NE Montserrat, SW Antigua (50 km NW), Guadeloupe (65 km SE), and Dominica (145 km SE). According to news articles, flights in and out of the region were temporarily suspended due to the ash plumes. Tiatia (Russia). A weak thermal anomaly was detected by satellite on 9 February. Ulawun (Papua New Guinea). Darwin VAAC reported that during 14-15 February ash plumes drifted 45-95 km at 2.4-3.7 km a.s.l. Bagana (Papua New Guinea). Darwin VAAC reported that during 11-15 February ash plumes rose to 2.4 km a.s.l. and drifted 20-150 km E and NE. Chaitén (Chile). Incandescence and gas emissions were observed from the lava dome on 28 January. During 21 January-3 February seismicity increased. The Alert Level remained at Red. Buenos Aires VAAC reported that a steam-and-gas plume drifted 25 km NW on 11 February at 2.4 km a.s.l. Dukono (Indonesia). Darwin VAAC reported that on 10 February a plume was seen on satellite imagery drifting 150 km SW at 2.4 km a.s.l. Karangetang [Api Siau] (Indonesia). Seismicity was reported to have declined during 1 January-8 February. White plumes were seen rising 100-200 m above the crater rim during clear weather. Incandescent material was ejected 10-50 m above the Utama Crater. The Alert level was lowered to 2 (on a scale of 1-4). Karymsky (Russia). During 5-12 February seismic activity was above background levels and possibly indicated weak ash explosions. Analyses of satellite imagery revealed a thermal anomaly over the volcano on 8 February; meteorological clouds prevented observations on other days. The Aviation Colour Code level remained at Orange. Kilauea (Hawaii, USA). During 10-16 February an active lava surface was reported about 200 m below a vent in the floor of Halema’uma’u crater. The lava surface occasionally spattered, and both rose and drained through holes in the cavity floor. A plume from the vent drifted mainly SW, dropping small amounts of ash and occasional fresh spatter downwind. Measurements on 11 February indicated that the sulphur dioxide emission rate at the summit remained elevated at 900 tonnes/day (2003-2007 average rate = 140 tonnes/day). On 11 February a significant rockfall or collapse event was followed by a brown plume for several minutes. Lava from beneath the Thanksgiving Eve Breakout (TEB) and rootless shield complex flowed over 3 km SE through a lava tube system before breaking out onto the surface. Thermal anomalies detected by satellite and visual observations revealed active lava flows on the pali and on the coastal plain. Incandescence was sometimes seen from a vent low on the S wall of Pu’u ‘O’o crater. Kliuchevskoi (Russia). During 5-12 February seismic activity was above background levels and lava continued to flow down the NW flank. Strombolian activity periodically ejected material 300 m above the crater. Steam plumes rose to 6 km a.s.l. on 8, 9 and 10 February, and were seen on satellite imagery drifting 65 km NE. Satellite imagery also revealed a large daily thermal anomaly at the volcano. The Aviation Colour Code level remained at Orange. Tokyo VAAC reported that on 13 February an ash plume rose to 6.4 km a.s.l. and drifted NW. Nevado del Huila (Colombia). 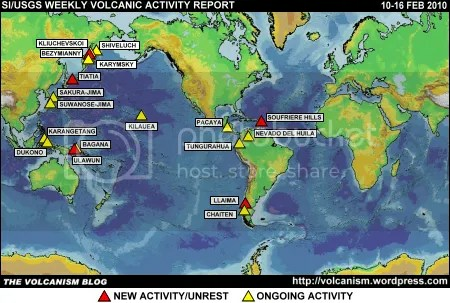 During 10-16 February whitish gas plumes were observed rising no more than 2 km above the lava domes. The rate of sulphur dioxide emissions was 945 tonnes/day on 10 February and 4,130 tonnes/day on 16 February. During an overflight on 12 February scientists saw gas emissions and thermal anomalies on the high part of the dome. Based on analyses of images, the volume of the extruded lava dome was an estimated 70 million cubic metres. Pacaya (Guatemala). Lava flows that have been descending the flanks since April 2006 were reported on 10 February to be continuing to flow down the E flank onto part of the meseta. Lava flows 100-400 m long descended the E and NE flanks during 11-16 February. Avalanches of blocks from the lava-flow fronts set fire to local vegetation. Sakura-jima (Japan). Tokyo VAAC reported that during 11-16 February multiple explosions produced plumes that rose to 1.5-2.7 km a.s.l. and drifted N, E, SE and S.
Shiveluch (Russia). During 5-12 February seismic activity was above background levels, possibly indicating ash plumes rising to 5.2 km a.s.l. Fumarolic activity was occasionally observed. Analyses of satellite imagery revealed a large daily thermal anomaly from the lava dome. The Aviation Colour Code level remained at Orange. Suwanose-jima (Japan). Tokyo VAAC reported explosions from Suwanose-jima during 11-16 February. Details of possible resulting plumes were not reported. Tungurahua (Ecuador). During 10-16 February explosions were detected by the seismic network, often producing ‘cannonade’ sounds and occasionally causing windows and buildings to vibrate. Blocks ejected from the crater fell onto the flanks and rolled up to 2 km from the crater. Ash plumes rose to 5.5-9 km a.s.l. On 11 February a small pyroclastic flow descended the N and NNW flanks. Ashfall was seen daily and impacted areas to the NW, W, SW and S. Ashfall was 3 mm thick in Choglontus, Cahuají and Pillate on 12 February and 1 mm thick in Choglontus on 14 February. 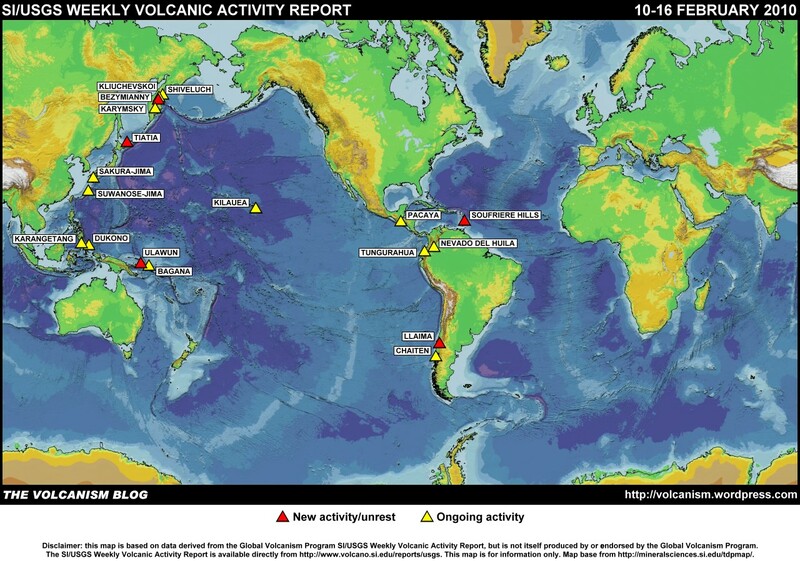 The foregoing is a summary of the Smithsonian Institution/United States Geological Survey Weekly Volcanic Activity Report covering 10-16 February 2010. It is provided for information only, and is based on but not a substitute for the full report, which comes with its own criteria and disclaimers. The map base is derived from the Smithsonian Institution/USGS/US Naval Research Laboratory This Dynamic Planet website. Has a youth and a student from Ontario, Canada, I was just looking at the volcano of Iceland, is there going to be any destruction on the earth, what should be do has citizens of Canada. We are worried that we should repair for the worst, is it going to be worst. I hope you can help and answer my questions with research, but true proof that can answer my questions. Thank you for giving me this time to discuss some important questions to you. Don’t get worried. In the great geological scheme of things, the current Iceland activity is an unremarkable eruption by a small volcano. It certainly isn’t ‘the worst’ and it’s very unlikely that anything it does will bother you much in Canada.